President Trump doubled down Monday on his attacks on the “Fake News,” brushing aside bipartisan criticism of his recent tweets to allege the mainstream media are the ones ignoring the real issues. At the same time, Trump used his Twitter account Monday morning to get back to business, providing a behind-the-scenes look at conversations with a plethora of European leaders ahead of his second trip abroad – and sending a tantalizing tweet about prospects for peace in the Middle East. Trump was castigated last week for his Twitter assaults on The New York Times, CNN and “Morning Joe,” which ate up most of the oxygen the administration was hoping to devote to “Energy Week.” On Sunday, Trump took heat for posting an edited video showing Trump wrestling someone with a “CNN” graphic covering their face. But fewer than 24 hours later, Trump showed the criticism hadn’t fazed him. “At some point the Fake News will be forced to discuss our great jobs numbers, strong economy, success with ISIS, the border & so much else!” Trump wrote. According to the Trump Twitter Tracker, Monday’s tweet marked the 55th time since his inauguration that Trump had cited “fake news” in a tweet. The tweet attacking “Fake News” organizations followed a series of Monday updates showing a more message-disciplined Trump focused — for now — on diplomacy. He is working the phones Monday with a number of U.S. allies before he boards a plane later this week bound for Poland and then the G-20 summit in Germany. Trump tweeted he would “be speaking with” leaders of Germany, France and Italy on Monday morning, and also offered new details about a Sunday call with King Salman of Saudi Arabia. “Spoke yesterday with the King of Saudi Arabia about peace in the Middle-East. Interesting things are happening!” he wrote, mysteriously. That call, according to a White House readout released Monday, focused on ending the Qatar crisis and came as Trump also spoke with the leaders of Abu Dhabi and Qatar. Trump also underscored the importance of stopping funding for terrorism, according to The White House. 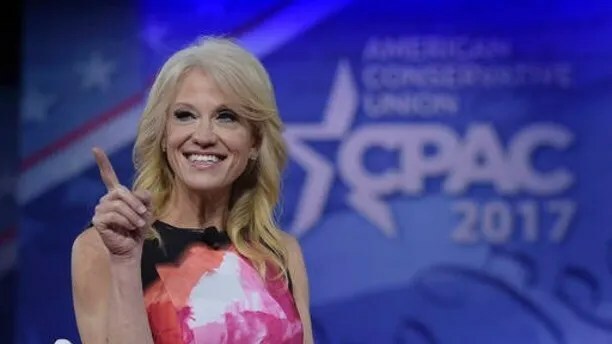 Kellyanne Conway speaks to a crowd at CPAC. Counselor to the President Kellyanne Conway picked up on Trump’s message, saying the president has been able to tweet about “fake news” and guide policy — but the media hasn’t shown itself capable of covering both stories. Trump promised to repeal Obamacare. Now what? Senate Health Care Fix or Folly? Will Trump's Deal of the Century Solve the Middle East's Problems? Are mutant ninja turtles real?